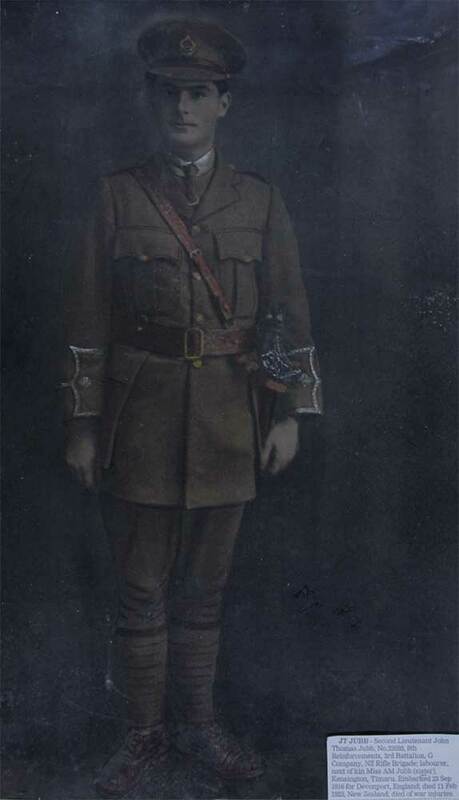 Jubb embarked for the front in 1916 after being promoted up the ranks from Pivate to Corporal, then Sergeant in November 1915. While serving on the Western Front he again recieved promotion to Second Lieutenant after attending Divisional School in February. Four months later he was reported wounded on 13 June 1917. Jubb recorded in his diary, held by the South Canterbury Museum, that after he was wounded he lay in a shell-hole for three hours before being recovered from the battlefield. Jubb served for a total of two years and 352 days, one year and 219 days in New Zealand and one year and 133 days overseas before being discharged in September 1918. On his return from the war jubb initially gave his intended address as the Railway Hotel, Christchurch, but this was changed to the Cashmere Sanatorium. When his medal action was first completed in March 1922 his address was given as "Cashmere Sanatorium, Christchurch", indicating he was still recieving care the injuries that led to his death in 1923.